Darren Macpherson has exhibited from LA to London and is well known as an up and coming artist. 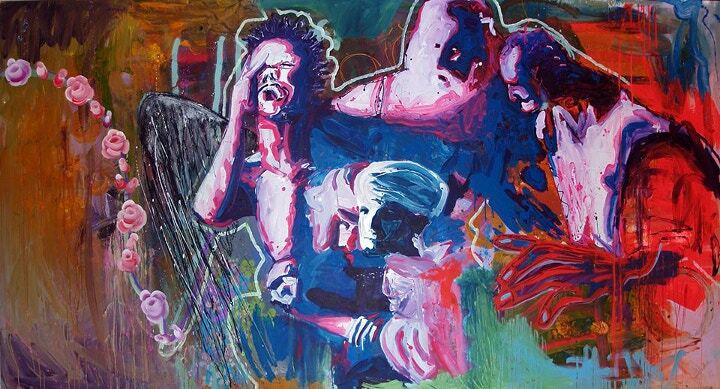 Working with acrylics, spray paint and oil pastels he creates vibrant figurative paintings exploring the human condition. Cass Art caught up with Darren and asked him for his advice for artists starting out with the medium. How were you first introduced to the art of acrylics? What was it that kept you keen? I’d tried every other medium before I discovered acrylics; I never had the temperament for watercolours or the patience for oils. I always searched for a more immediate response, a substance that offered the same creamy consistency as oils but that which could be changed quickly, removed and added to at will; wiped off, watered down, dried quickly and so on. Acrylics have been the only medium that has offered my artistic style and me everything it desires, and I’ve exulted since that day! Initially, I used cheaper acrylics and wasn’t satisfied until the market began offering more choice, these days the choice of product, colour and body is enormous. And it’s growing; I’ve always used spray paint and mixed different mediums to create varying textures and grounds. I’m excited to have recently started using Liquitex Acrylic Spray paints as you can work them into standard acrylic paint. As I use a lot of water in my technique (sprayed onto the support in copious amounts) to achieve a multitude of depth and layering, which is then often force dried with a heat gun, the stability of the medium is what has held my interest for so long. The fact that I can create layer upon layer in a fraction of the time of comparative mediums and still have the paint hold the required hue and saturation is extremely satisfying. What are the essential materials for acrylic painting? What couldn't you live without? There are so many items and implements that are fundamental to my daily practice. My Daler Rowney System 3 brushes are probably the only immaculately maintained objects in my studio. Until I discovered these brushes in a case my brushes were strewn everywhere and were soon ruined. My greatest discovery at CASS ART though has been the fabulous Liquitex acrylic paint. I must admit to having literally stacked boxes of the Liquitex sets of 48 paint tubes. I burn through so much paint I could never afford to run short, and the small tubes are ideal for my technique and application. I also use Stabilo Woody colouring pencils frequently; I love the innocent child-like rendering they define. I have small children and using these pencils I try to describe the simplicity of childhood, whether it be a mere line, some text or a sketch. The fact that they are water-soluble is an added bonus so the interaction with the acrylic paint is complete. I’m like a sponge when it comes to inspiration; I’m absorbing all the time. Architecture, nature and of course the human form. At the moment I am a little obsessed with depth and perspective, I’ve been gradually introducing this into my work. I recently painted some chess sets for purling London, which sold in Harrods, and I’ve noticed the chequered layout of chessboards appearing more and more. It can give a sense of being able to step right into the work. When I have time I try to get along to art galleries and study the old masters work, I have a particular penchant for Italian renaissance painting, its easy to become absorbed in the brushwork of Titian for example, I firmly believe a painter must continually challenge and push their practice in order to grow and develop as an artist. And the Saatchi Gallery space is incredible, it allows for painting on such a huge scale; I’ve done some 3 metre wide pieces but I was recently blown away by an 8 metre wide Eddie Martinez painting at Saatchi. My working process is one of planning and chaos. Not necessarily in that order. I am always experimental and will always attempt new ways to present my work whether it is on canvas, MDF or ply. I try to employ a variety of painting styles within one piece, some stencilling or sketching may occur in one piece and not in another. However this needs to be underpinned by an overriding style that may be recognisable and attributable; I want people to look at my work and know they identify the style as my own. Could you share your expert tips on how to achieve an amazing technique for acrylic? Firstly you must use the best possible materials at your disposal. Its better to purchase a few better quality paints than a full set of cheaper ones. But don’t scrimp on it, I know that sounds contradictory but you must commit fully to the painting, and if it requires a certain volume of paint then so be it. Acrylic paint is so versatile that you can achieve pretty much any characteristic you like from washes to impasto. Also don’t be afraid of using colours that you may not ordinarily be drawn to, or be reluctant to use. One of the beauty’s of acrylic paint is the array of colours and hues, so why not take advantage of that. I love the buttery, creamy texture of acrylics and I personally like to meld the paint together, which makes some incredible swirls and textures. I will often sketch outlines direct from the tube of paint maybe with three or four contrasting colours ensuring the fluidity of my movement equals the fluidity of the paint. One of my influences is Richard Diebenkorn, he asserted that “If you get an image, destroy it.” I take this to mean that if you are not fully satisfied with it, keep working it over, don’t just remove it or totally paint over it, but work it into the painting until it comes alive. One of the benefits of acrylics is that if you make a mistake or you’re not fully content with something its easy to amend or change it. To stick with it. If you have chosen the medium keep with it until you find a technique and style you are happy with. There is a theory called the ‘Helsinki Bus Station Theory’ by Arno Minkkinen regarding creatives that essentially states that whatever medium or direction you have taken as a creative, keep doing it, don’t chop and change thinking that achievement will present itself simply by changing your practice. Success can only be realised by following the same route, even if you feel that your work is not unique and that many others are doing the same as you. Oliver Burkman in the Guardian states ‘if you pursue originality too vigorously, you'll never reach it. Sometimes it takes more guts to keep trudging down a pre-trodden path, to the originality beyond’. My final piece of advice to any artist just starting out would be to just get your work out there; exhibition opportunities can be rare and infrequent so take advantage of as many breaks that come your way as you can, after all, we all need our work to be viewed, critiqued and acknowledged to move closer to becoming established. You can find Daren's work at Lime Wharf from tonight until the 16th March, with more information on the Degree Art website. You can find more information about Darren's work on his website or follow him on Facebook, Twitter, Instagram or email him to get updates on new exhibitions. Feeling inspired? Shop online now and stock up on your art supplies and follow us on Facebook and Twitter for the latest artist interviews and featured exhibitions.